We became interested in the development of a new approach to wildlife monitoring when we were monitoring black rhino in Hwange National Park, Zimbabwe, and Etosha National Park in Namibia in the late 1990’s. We were using radio-telemetry to monitor collaring and ear-notched rhino. 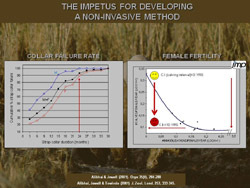 We collected data from radio-collared animals through an 8-year period, and these data began to indicate early on that the chemical immobilization necessary for this technique was negatively impacting on female fertility (Alibhai, et al, 2008, Jewell et. al., 2001). Furthermore, around 60% of radio-collars failed within 6 months of fitting, and had to be replaced – if the host animal could be relocated (Alibhai & Jewell, 2001). As animals gained body condition the collars would tighten, and irritate, or seriously lacerate. It was very expensive, dangerous and frustrating work. At the same time, we were walking through the bush every day with expert indigenous trackers, whose years of experience and tradition of tracking (probably the oldest profession in the world) enabled them to identify animals from their footprints. We thought that if it was possible to somehow capture their mind’s eye in this process and adapt it for rigorous modern technology, that would be a fantastic advance in monitoring; after all, everywhere the rhino went they left footprints, which effectively gave a true picture of their daily activity both in terms of where they went, and what they were doing. We then began the voyage of discovery into translating this process into a Footprint Identification Technique (FIT) that was accessible to conservation biologists.